Charlotte’s 7th officials ‘Open Streets 704’ is gearing up to shut down the streets to motorized vehicles and open them to all varieties of bikes, scooters, walkers, and unicyclists. The streets will also open up to dozens of artisans, street vendors, musicians and classes for residents to freely explore. 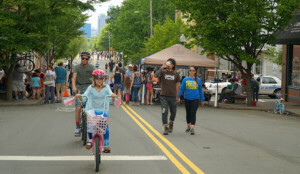 Open Streets 704 returns to its most popular NoDa-Plaza Midwood route on Sunday, April 28, 1 – 5 p.m. Last Spring, Open Streets 704 saw over 30,000 neighbors wind their way through NoDa, Villa Heights, Optimist Park, Belmont, Plaza Midwood, and Commonwealth. After the success of the BOOM! Charlotte stage at the Fall 2018 Open Streets 704, both committees decided to do it again in an even bigger and better way! Open Streets 704 will take place on the third day of Plaza Midwood’s popular BOOM! Charlotte festival this year. BOOM! Charlotte will bring part of their party of arts and entertainment to the streets, and take over the Arts & Sciences Zone on Commonwealth & Thomas Avenues. Enjoy this part of their great festival for FREE! This was so popular last spring, the beers sold out in at least 3 participating breweries before the streets even closed down again! This year, they’re at it again — 6 breweries along the route will brew a special collaboration beer, each adding its own special twist. And here’s one more twist — Legion Brewing has designated Open Streets 704 as their “Charity on Tap” for the entire month of April. 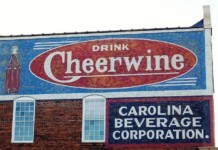 This allows proceeds of a daily beer sale to benefit Open Streets 704. Cheers! We are excited Southminster had so much fun with Open Streets 704 last spring, that they are stepping up their role! Southminster will sponsor a stage for multigenerational fun at N. Davidson & 27th Streets, with art, movement, and music for all ages. They’ll also bring 4 “Trishaws” to share as part of their Cycling Without Ages program, so family members of all ages can enjoy the route together. Open Streets 704 is a great time to show cars, bikes, and pedestrians how safe the streets CAN be with street demonstration projects. This time, they’ll paint “Sharrows” on Hawthorne Lane at Kennon Street as part of The Plaza street conversion project. Lane markings will be made clearer, and another “Painted curb” art project will invite participants to share the fun. Music everywhere! Get up and dance! and spring to support it. Can you be our friend? 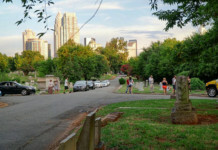 Parks to support Open Streets 704, their signature event.